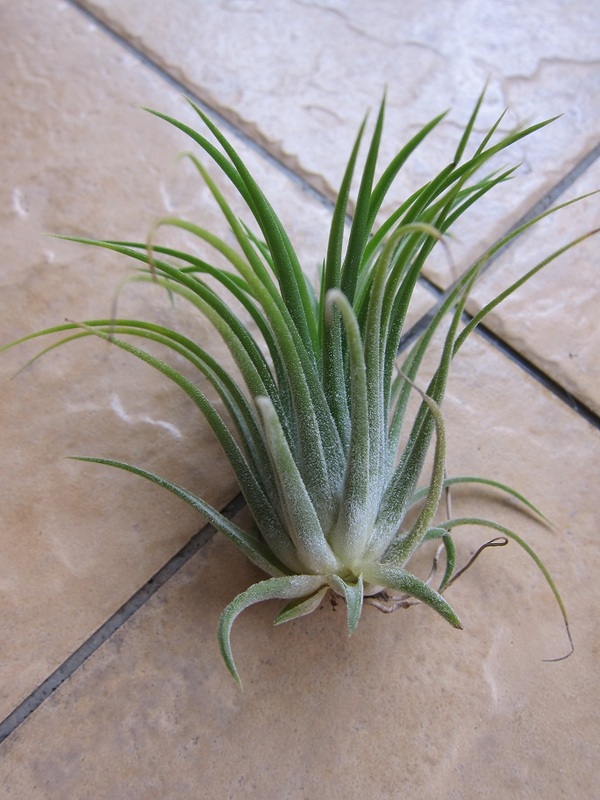 I was going through my previous posts recently and I realised I have yet to write on T. ionantha, which is just plain wrong. A blog on Tills that makes no mention of ionanthas?! How is that even possible? 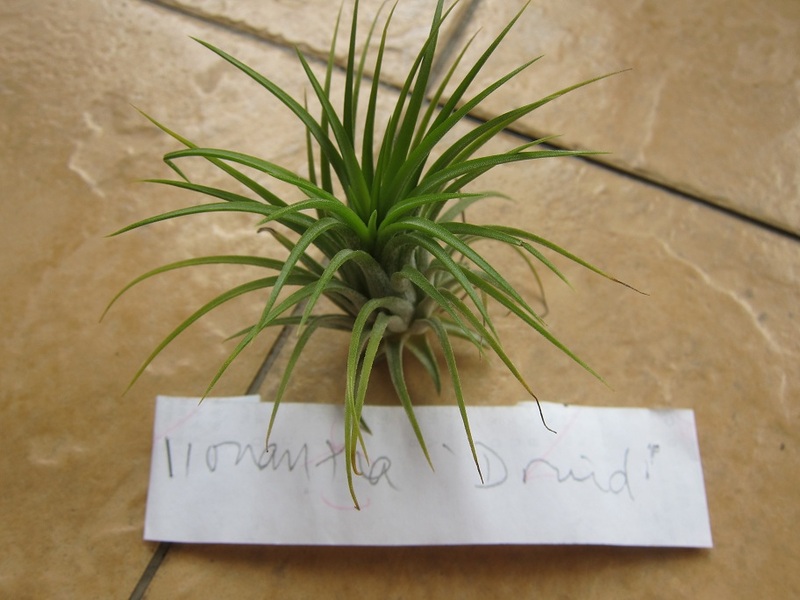 Well I decided to remedy that by writing on T. ionantha ‘Druid’, which is a variation on the standard T. ionantha. I say standard but I should mention that there are very many different forrms of ionanthas. This is likely due to the wide range of their natural habitat, which ranges across Central America, including Mexico, Costa Rica, El Salvador, Guatemala, Honduras and Nicaragua. As a result there are so many variations that it is almost mind-boggling; with some maturing at a petite 1″ to 2″ while others grow up to 4″ and are up to 3″ across. Even the colouring of its leaves when it flowers varies, with some turning a bright yellow, others peach and of course the most common and most stunning of all, the deep reds. 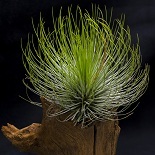 Rarer forms include the ‘crested’ form and ‘variegated’ form, and these also have price tags to match. Anyway I am not even going to attempt to describe all the various forms, instead I have included below a few different types of ionanthas I have managed to collect, despite telling myself an ion is an ion, I still cannot resist picking up those that look even marginally different than what I already have – price permitting of course. 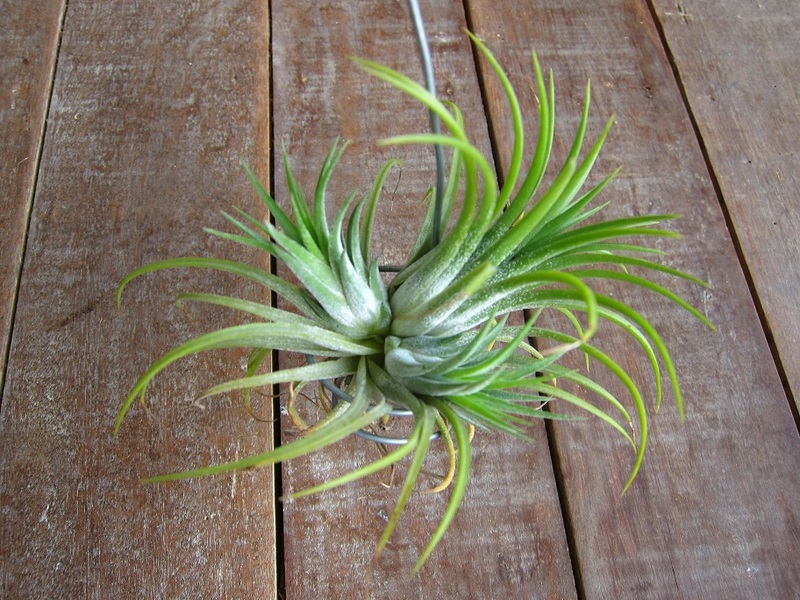 Well T. ionantha ‘Druid’ is one such variation, occurring naturally in the Veracruz area of Mexico (refer the Bromeliad Cultivar Registry). 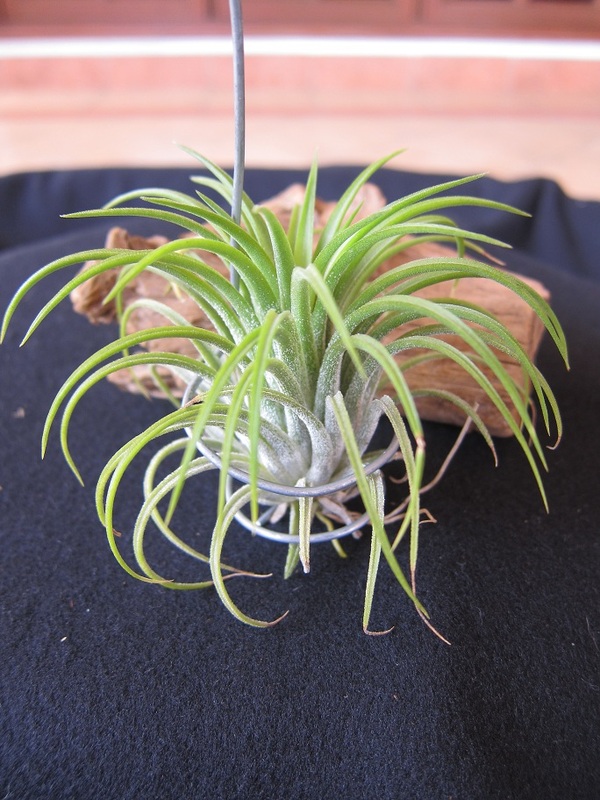 First appearances indicate an ionantha ‘Druid’ is exactly like a regular ionantha; growing in a stemless rosette, with succulent straight leaves that taper to a narrow point. The base of the leaves normally has a thick covering of trichomes – giving it a silvery appearance, which gradually becomes sparser towards the tips of the leaves. 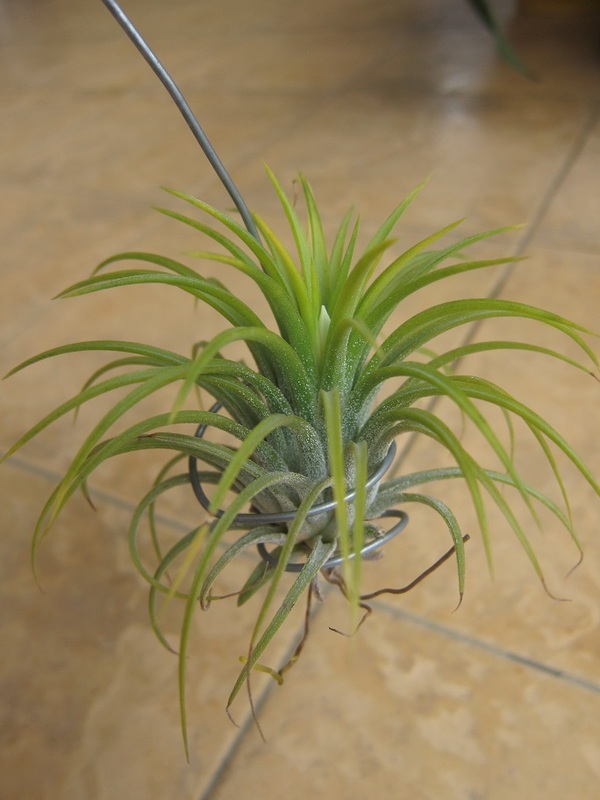 I managed to get my hands on an ionantha ‘Druid’ in August 2012, and as you can see from the pictures below, it looks fairly unremarkable and is indistinguishable from your typical ionantha. 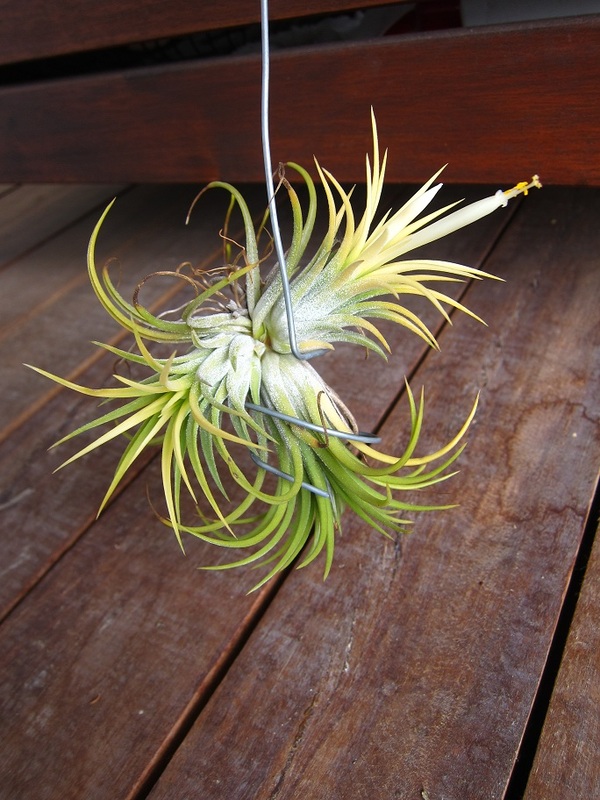 Well it is an ionantha, so what else do you do but wire it up and leave it to do its’ thing! And sure enough I did not have to wait long, just three months in fact, before it began to show signs of blooming. 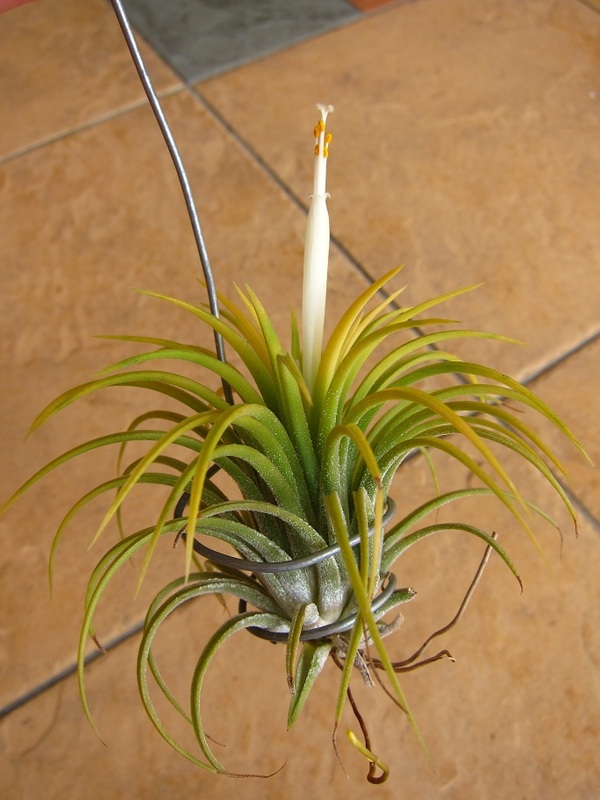 For some reason I got it in my head that a yellow, white-flowering ionantha would not take kindly to too much sun, therefore I kept it mostly in bright shade with maybe a couple of hours of direct sun. Because of this, and as you can see from the pictures below, the leaves did not blush a very deep yellow, which was somewhat disappointing. 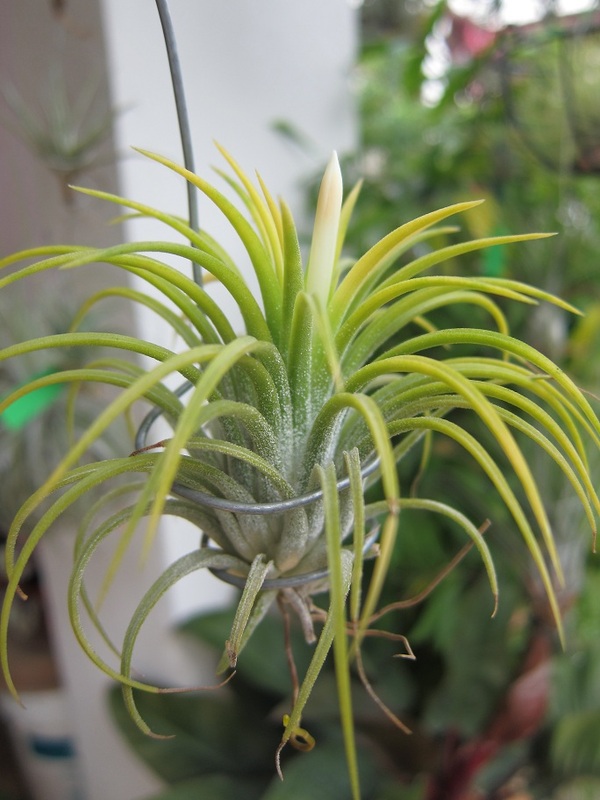 When it is flowering is when you can see what differentiates an ionantha ‘Druid’. Its leaves do not turn deep red, rather it turns bright yellow (or rather it should, mine probably being the exception!) and the flowers are white rather than the deep purple that is the norm. Initially I did not think this form was anything special, but having seen it in bloom for real, I actually find I enjoy the unique colouring of both the leaves and the flower. It provides some variety to the typical red leaves and deep purple flowers which tend to be the norm with Tills. 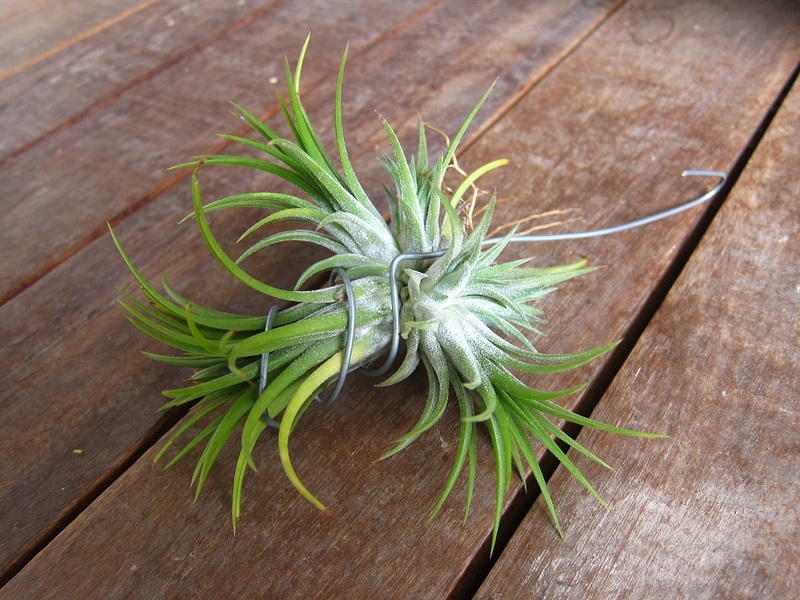 The flower unfortunately does have the life span of a typical ionantha flower though, so it lasts about a day! 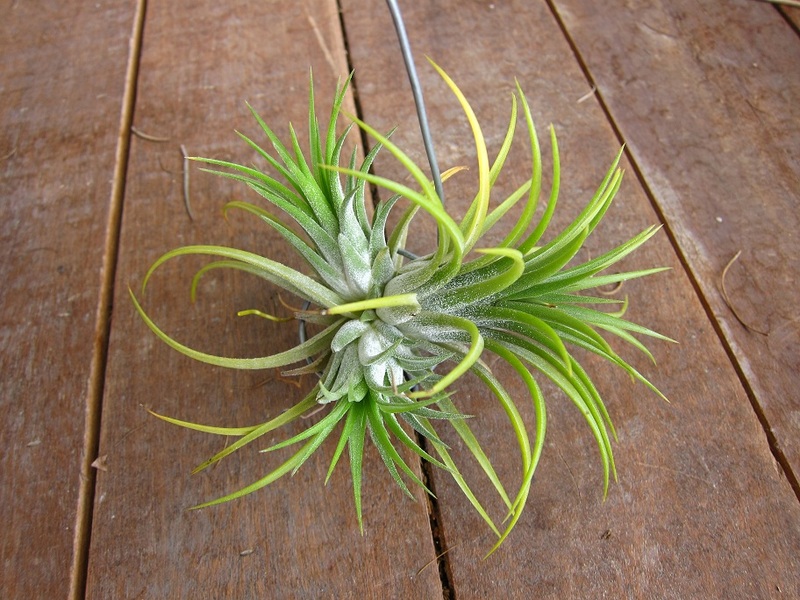 Well a month post bloom saw it reverting to typical ionantha mode, notice the dried flower petals in the picture below. After this I was busy moving house and therefore the next picture I have is more than three months post bloom, and by this time there were two decent sized pups at the base of the plant. 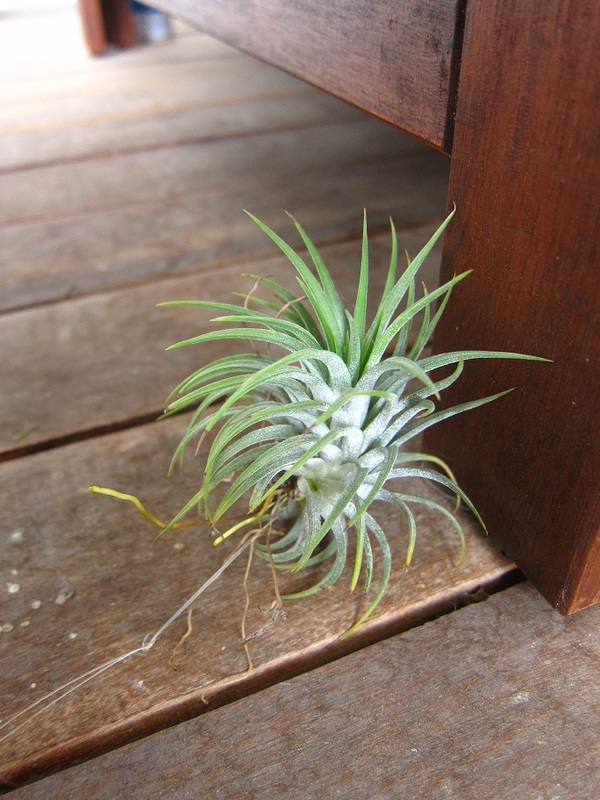 Both pups grew steadily and attained the same size as the parent plant about six to seven months from their first appearance. Indeed before I knew it both pups began to turn yellow, which was the first indication they were going to bloom. Before I could take pictures, the first flowers had already appeared. 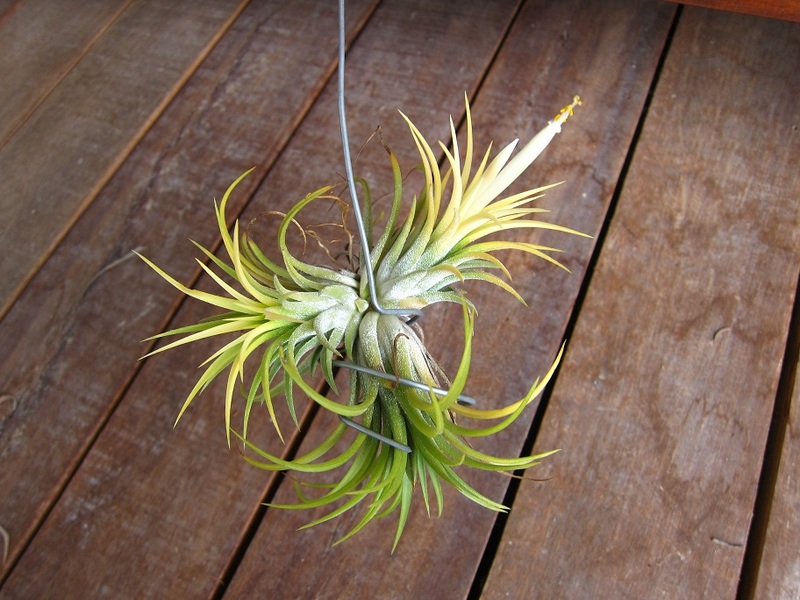 At least this time the plant was sat out in the scorching afternoon sun so the leaves were a nice bright yellow. And better yet, both pups bloomed at the same time! Well sort of anyway, because the leaves of both were at least yellow at the same time. I do not actually have pictures of both pups in bloom at the same time and have absolutely no recollection if they did, but am going to assume as much. As I was browsing through my pictures I found the one below, which means I cross-pollinated the two plants. 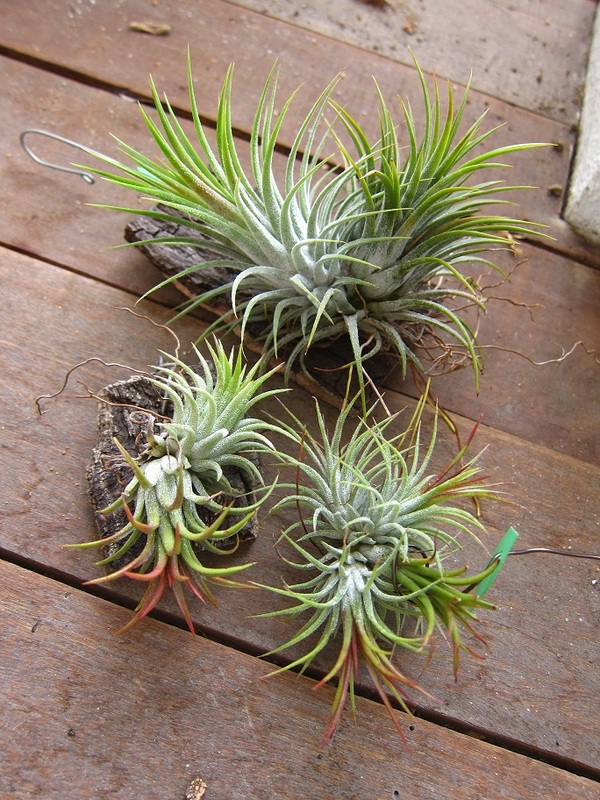 The small plant is T. loliacea. This is how I keep track of any pollination I have done, unless it is self-pollination. Admittedly it is probably not the best way of recording things, but I am simply not organised enough to do it any other way! It is about three months post bloom now and I have yet to see any seed pods, so it looks like I was not successful though. Oh well, will just have to try again next time. 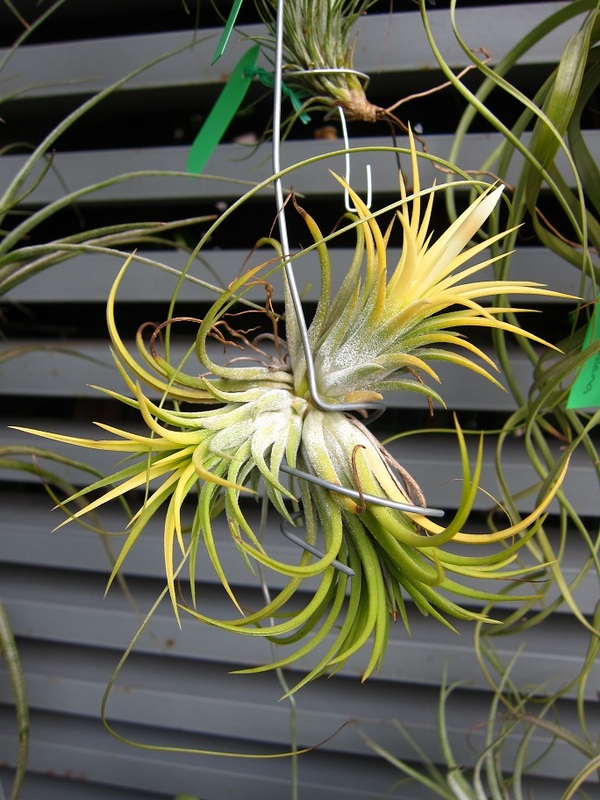 A few more pics of the bloom are below, including one showing a growing seed pod in the parent plant. 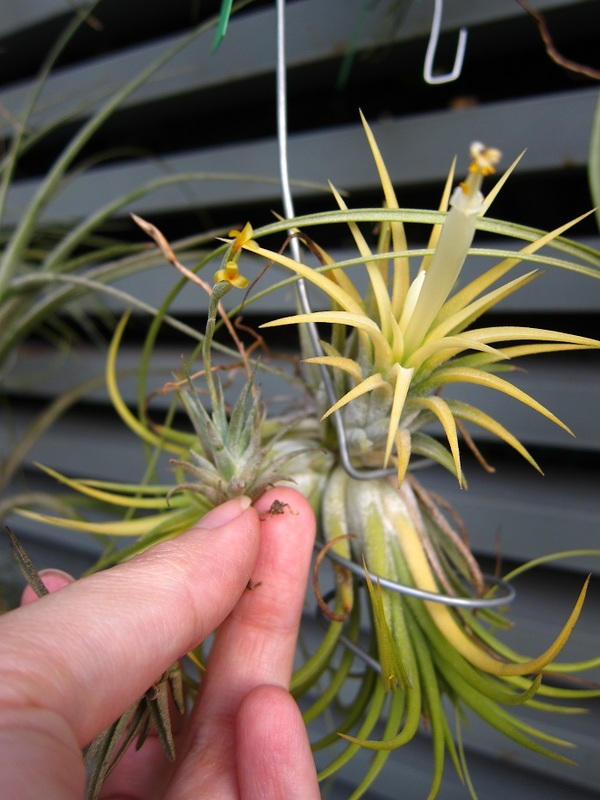 I have no pics of cross pollinating the parent plant though, so it is likely self-pollinated. I am only now just working out the length of time it has taken for the seed pod to emerge, and it is far longer than I would have expected. 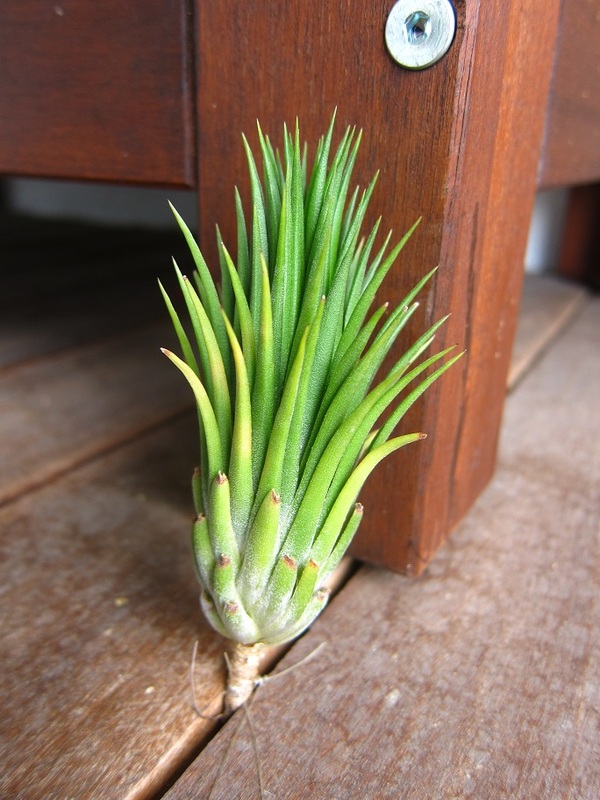 After all the next generation has already bloomed and pupped and the parent plant has yet to disperse its seeds, so this must be a major investment of resources for the plant! I am looking forward to sowing the seeds and having a go at growing seedlings. I have not had much luck to date with sowing seeds, so will continue experimenting with various methods. Don’t expect a post on growing seedlings any time soon though, because I foresee many failed attempts in the coming future. As I mentioned it is approximately three months since the second round of blooms and the pups themselves have had one and two pups respectively. 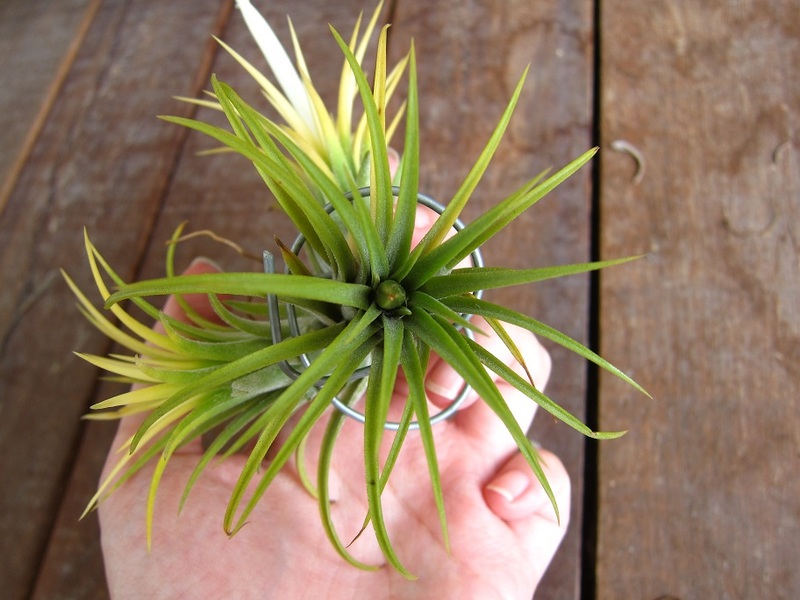 Growing ionanthas in Malaysia is fairly easy because they love the sun. I am of course speaking generally here, as not all forms are able to tolerate full direct sun, but it should be safe to say that those that you find at the local nurseries are sun-loving. I have had ions growing in full morning sun and full afternoon sun and they all do well. The danger with ions actually is rot rather than too much sun, probably because if you have them upright and exposed to the elements, water quickly becomes trapped in the centre. It is much safer to mount them upside down or sideways, and by doing this they are almost indestructible (good air movement being the prerequisite of course). Just be sure to clear away the dead leaves at the base every so often. 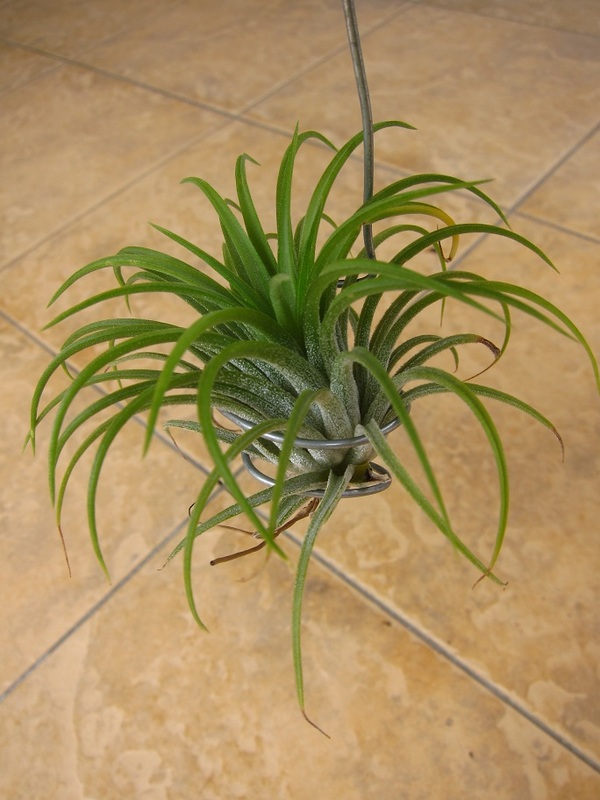 The other issue is that ions clump quickly, after all this plant is already on its way to being a clump and it has only taken about a year, which is incredibly quick in terms of Tills. 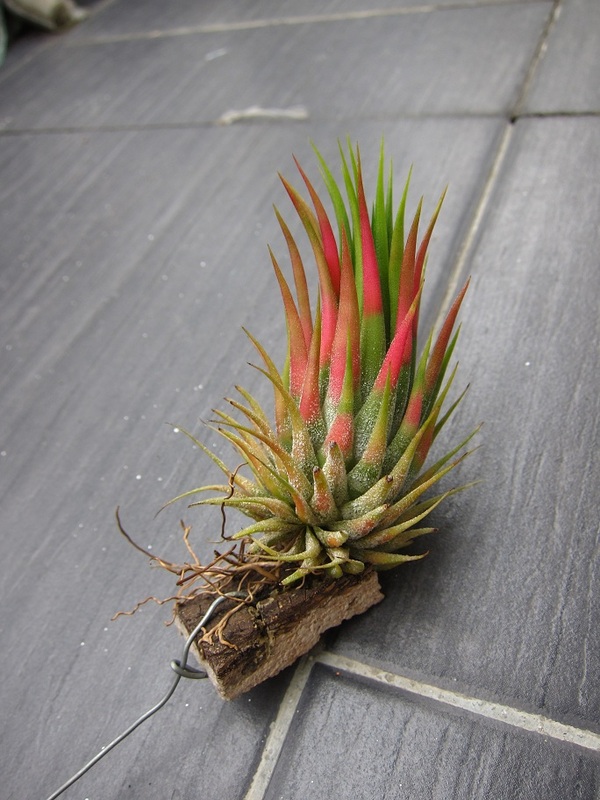 Clumps, quite simply, attract rot in our tropical climate, so you have to be extra vigilant with ensuring the centre of the clump dries out in between waterings. In fact, as I am writing this, we have had torrential thunderstorms every day for more than a week, so it would be safe to say that now would be a good time to check any clumps you have, and indeed any Tills you have, and if necessary bring them in under shelter for the time being. 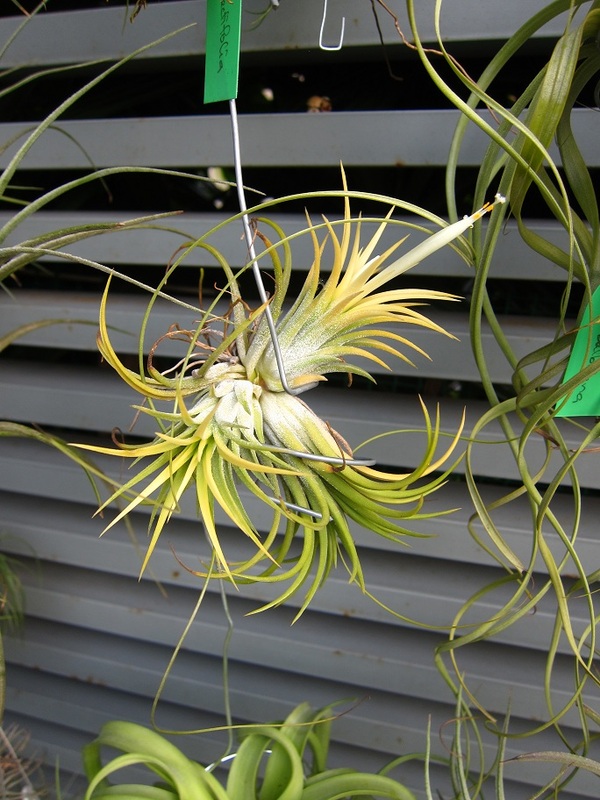 Unfortunately I cannot take my own advice since I do not have a sheltered area to keep all my Tills, therefore they are all hanging upside down at the moment in the hopes that this will help keep water from collecting in the plants. My fingers are crossed that this works! Happy growing everyone! That’s alovely write up. 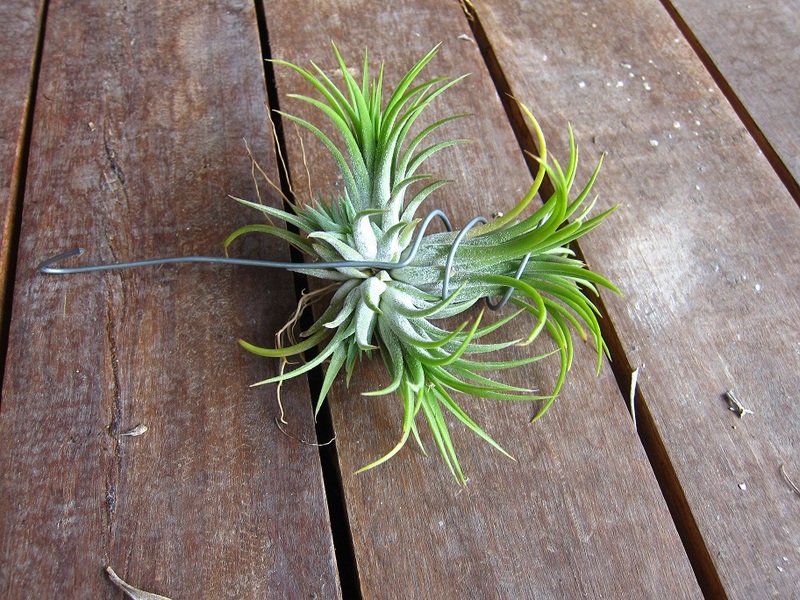 Came across your blog by accident as I just learnt about Tilandsia and have never grown anything in my life. Basically are they easy to grow? and do you propogate & sell your plants? Thanks for passing through. Generally ionanthas are pretty easy to grow, just be sure they have the basics; sun, air and water and they tend to thrive in our climates. 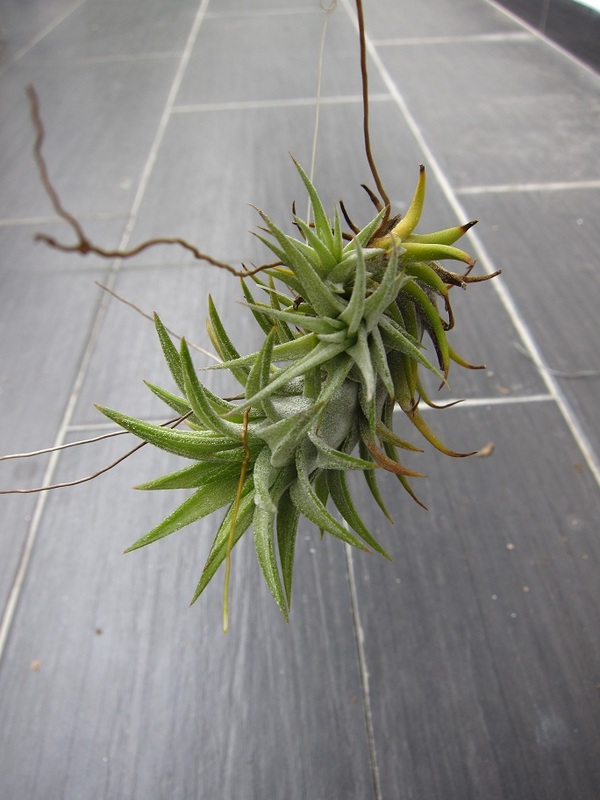 Unfortunately collecting these plants is purely a hobby for me, so I do not have any for sale, but if you are based in Malaysia I can pass you details of individuals who do sell Tills. Let me know! I too stumbled across Tilly’s and your blog accidentally. I live in the Pacific Northwest in the USA, so mine are growing inside, in my bathroom. I am very nervous about the watering part of the “light, air and water” equation. I want to provide my Tilly’s with the best possible home. How do you judge your watering? Hy Minigemm, love you post! I came to your blog through the post of brachycaulos, mine is blushing now, but i was searching information about water in the rosette, that seems to accumulate in her. Indeed, all my Tills are upright, once i had opportunity to see them in natural habitat, and they always grows this way, even when the need to curve 180°. I am now waiting for my Druid arrive. Bought one last week. But i am writing to you because the seedlings. I’ve been trying since past year and i’m having some success. If you enjoy to share some ideas, i’m up! 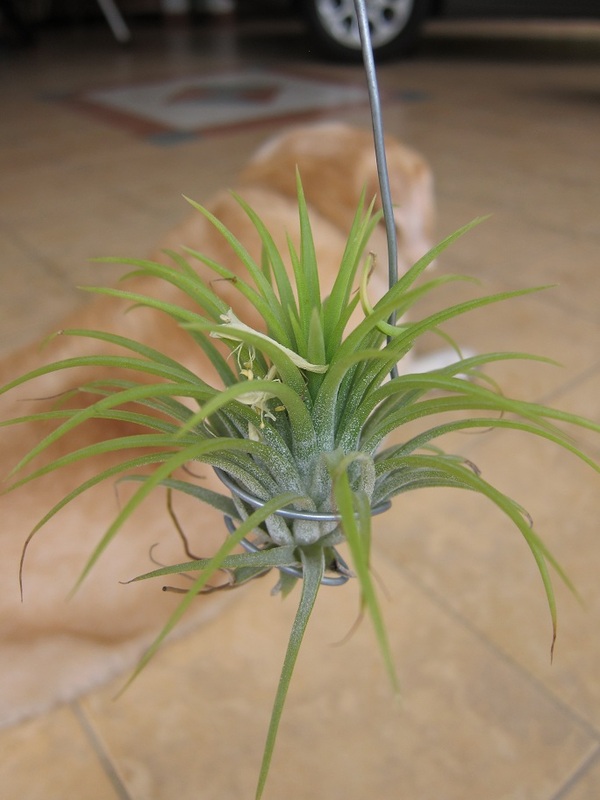 This entry was posted on September 5, 2013 by minigemm in 'Druid', ionantha, Tillandsia and tagged bloom, care, druid, flower, ionantha, offset, offsets, pup, pups, tillandsia.